Mosiah 23:3 Alma1 and his converts left the city of Nephi and environs, entered the wilderness, then traveled eight days' journey in the wilderness to the land of Helam. Mosiah 24:20 Alma1 and his people traveled all one day from the land of Helam to the valley of Alma. This verse implies a longer than normal travel day. Mosiah 24:25 Alma1 and his people traveled twelve days in the wilderness from the valley of Alma to the southern border of the lesser land of Zarahemla. Alma 8:6 Alma2 travelled three days' journey north from the land of Melek to the city of Ammonihah. Alma 22:32 An east-west boundary between the land Desolation on the north and the land Bountiful on the south was one and a half day's journey long. Mormon's use of the diminutive "only" implies this was a modest distance in Nephite affairs. See the blog article "A Nephite" for analysis showing this term meant an ordinary member of the Nephite polity rather than an elite individual with exceptional prowess. Helaman 4:7 A shorter east-west fortification line entirely contained within land Bountiful was one day's journey long. The text describes a similar unit of measure in the Old World, although camel caravans treading the sands of the Levant or Arabia probably traveled a longer distance in one day than pedestrians in Mesoamerica 1 Nephi 2:6. In an attempt to deduce a likely straight-line distance for the Nephite New World "one day's journey," we looked at many known pre-industrial journeys in southern Mesoamerica. See the blog article "Land Southward Travel Times." Our conclusion: 15 air or straight-line kilometers is a reasonable distance for a cultural construct measuring one day's journey. The Book of Mormon map that has evolved through this blog since 2011 assumes a Nephite unit of distance measure equal to 15 air kilometers per day. The blog article "Test #6 Relative Distances" shows how precisely this derived metric correlates with the text. John L. Sorenson's model is much more problematic. Kaminaljuyu, Sorenson's correlate for the city of Nephi, sits on the continental divide at an elevation of 1,540 meters. 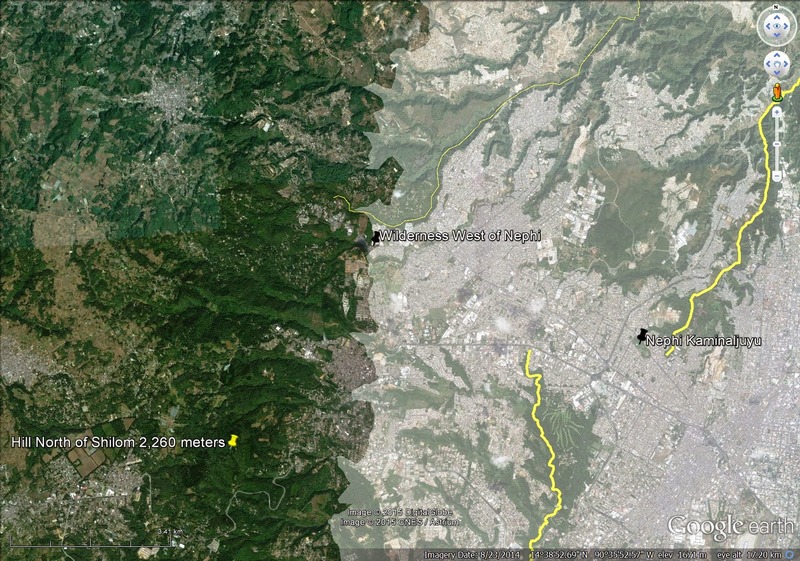 A terrain plane set at 1,700 meters roughly defines the western edge of urban Guatemala City today. 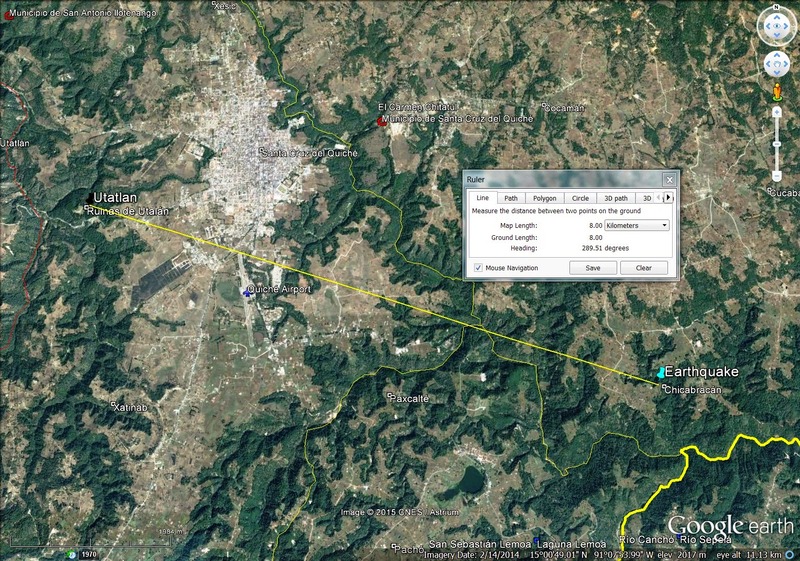 This provides a reasonable point where Alma1 and his converts could have entered the wilderness on their way to Helam. 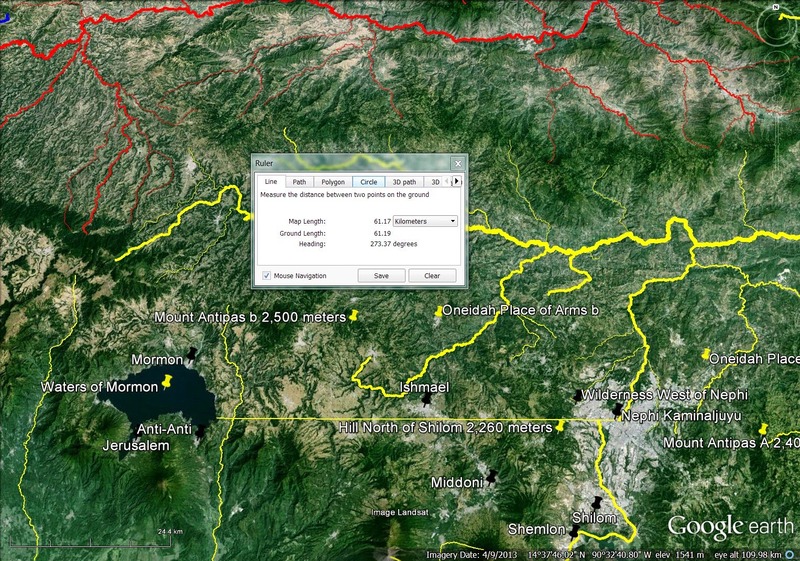 Sorenson has two potential locations for the land of Helam: Aguacatan or Malacatancito, both in Huehuetenango. Aguacatan, home to the scenic "nacimiento del rio San Juan" is 107 air kilometers from the wilderness west of Nephi. Malacatancito is 116 air kilometers distant. 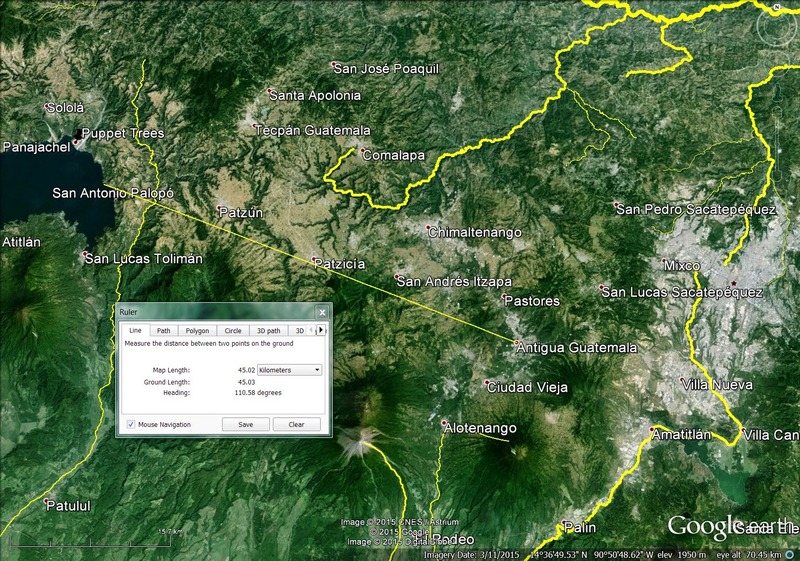 If Aguacatan is Helam, a Nephite day's journey is 107/8 days = 13.38 air kilometers/day. If Malacatancito is Helam, the number is 116/8 = 14.5 air kilometers per day. These numbers are slightly short, but still in the ballpark of reasonableness compared with the 15 air kilometers/day metric described above. They point out a stark contradiction, though, in Sorenson's map logic. He correlates the waters of Mormon with beautiful Lake Atitlan. Mosiah 18 describes Alma1's converts traveling to the waters of Mormon for Sabbath observances, then returning to their homes in the lands of Nephi and Shilom during the work week. The shortest possible distance between Kaminaljuyu and Lake Atitlan is 61 air kilometers, a four day journey given the Nephi to Helam distance plotted above. Round trip would be an eight or nine day journey. If the city of Nephi is in the valley of Guatemala, Lake Atitlan is much too far away to be the waters of Mormon. 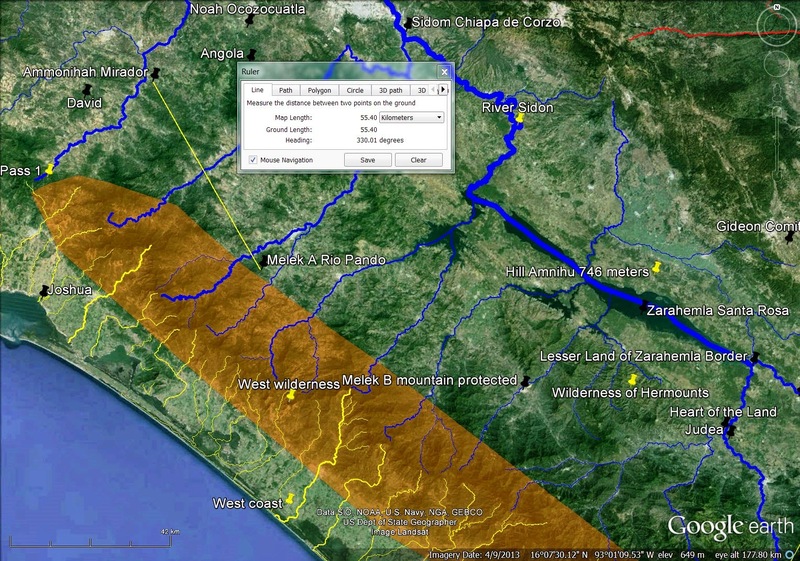 Sorenson identifies Huehuetenango as the valley of Alma. It is 19 air kilometers distant from Aguacatan which fits the sense of Mosiah 24:20 nicely. 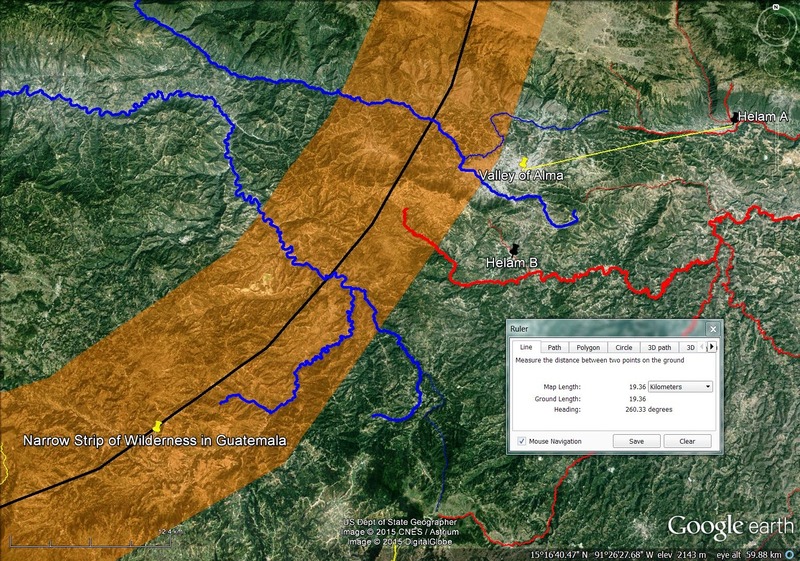 Malacatancito, on the other hand, is only 5 air kilometers from Huehuetenango. This distance is so short it directly contradicts the text. The distance from Sorenson's valley of Alma to his lesser land of Zarahemla is another serious contradiction. It is only 101 air kilometers from Huehuetenango to the head of the Mezcalapa-Grijalva at the confluence of the Cuilco with the Selegua. 101/12 days = a mere 8.4 air kilometers per day. This small distance begs credulity. It is completely out of proportion with the Nephi to Helam and Helam to valley of Alma legs of the journey. No historical journey in southern Mesoamerica of which I am aware moved that slowly (see the blog article "Land Southward Travel Times." Even counting all the days they huddled freezing and dying in the snow, the Martin Handcart Company averaged 13.94 air kilometers per day. Even fighting battles along the way from Waka (El Peru) to Tikal, Fire is Born and his shock troops from Teotihuacan averaged 9.75 air kilometers per day in their AD 378 conquest of the Peten. 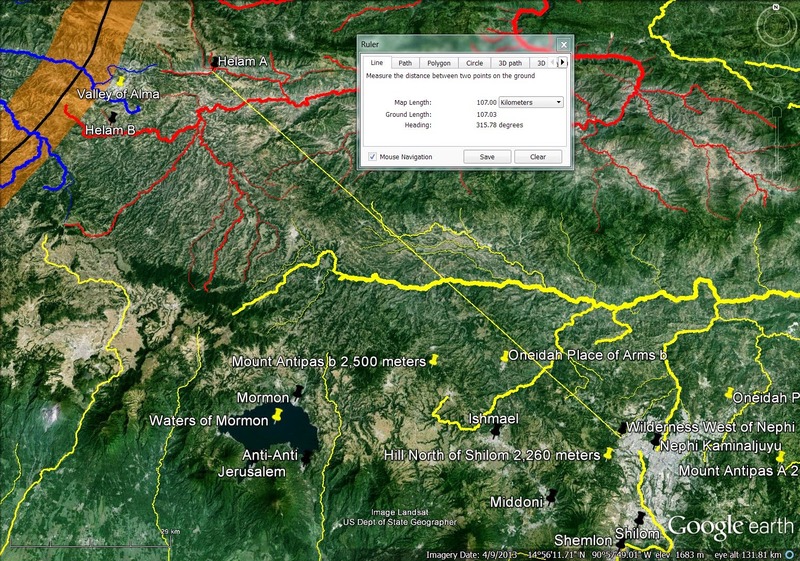 Sorenson's valley of Alma to Zarahemla distance is unreasonably short and therefore a poor fit to the text. 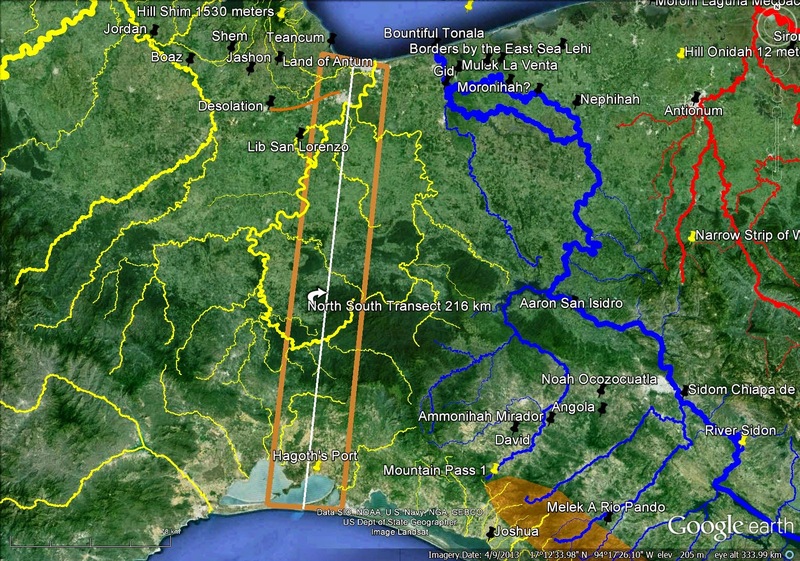 Sorenson offers two possible lands of Melek, one on Rio Pando and the other that he calls "mountain protected" west southwest of Santa Rosa on the Jaltenango. His Ammonihah is Mirador on the La Venta. The text explicitly says Ammonihah was three days' journey north of Melek Alma 8:6. 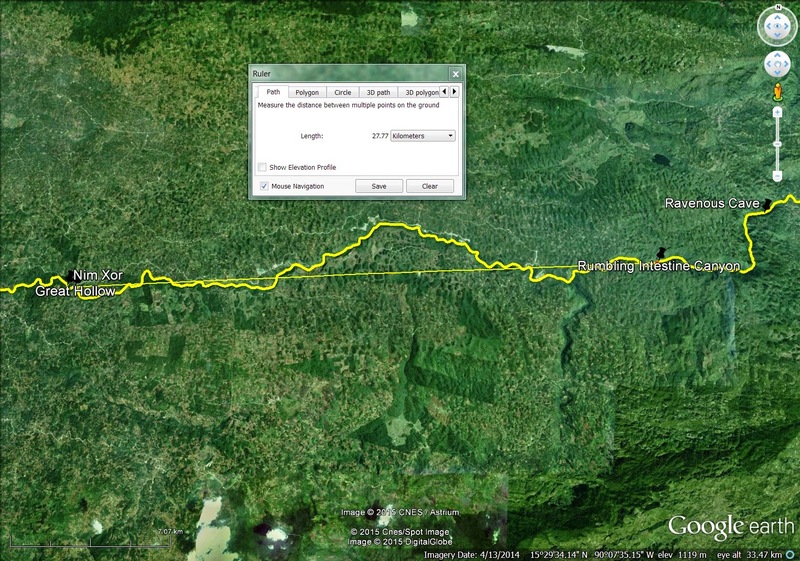 Mirador is 55 air kilometers north northwest of the Rio Pando site. 55/3 days = 18.33 air kilometers/day which is on the high side but possible in southern Mesoamerica. On the other hand, Mirador is 123 air kilometers west northwest of the Jaltenango site, 123/3 days = 41 air kilometers/day which is ludicrous. Even that untenable number, though, pales in comparison with Sorenson's idea that the day and a half's journey in Alma 22:32 was across the entire Isthmus of Tehuantepec from the Gulf of Campeche to the Pacific, a distance of 216 air kilometers. 216/1.5 days = 144 air kilometers/day. This number is so large it is a whole order of magnitude beyond reasonableness. This is a summary of Sorenson's proposed distance metrics. These glaring inconsistencies are a mass of confusion. Like the Nephites, the precontact Quichean nations of western highland Guatemala had a standard unit of distance measure they called "one day's journey." 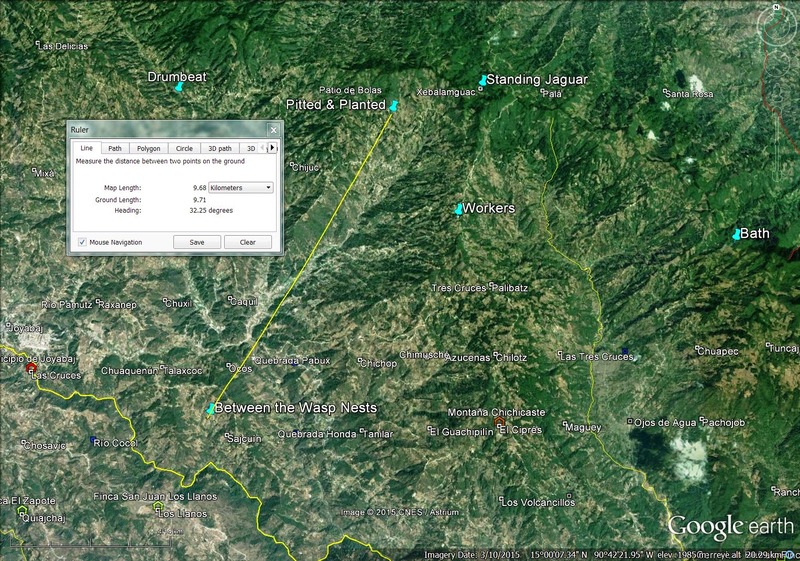 Plotted on modern maps, the distance works out to be very close to 15 air kilometers per day. Like the Book of Mormon peoples, Quiches & Rabinals were consistent in their usage of this metric. Our sources for the following examples are the same two works by Dennis Tedlock referenced in the blog article entitled "Quichean Directionality." In Cawek's fifth speech, he refers to the Rabinal domain in parallel verse as pa jun warab'al pa kay warab'al "one day's journey, two days' journey" (Rabinal p. 50). Movement references in Rabinal Achi are typically west to east. Rabinal territory after the conquests by Quicab in the early 15th century was about 30 kilometers from west to east. A good metric for this reference is 30/2 days = 15 air kilometers per day. When precontact Rabinals spoke of "one day's journey" they had in mind a distance of about 15 air kilometers. The Rabinal also had a smaller unit of distance measure they called k'a'm "cord" which is about 18 meters in length. It was primarily used for demarcating land areas such as homesteads and cornfields, but it could also be used for measuring distances from point A to point B (Rabinal pp. 55-56). 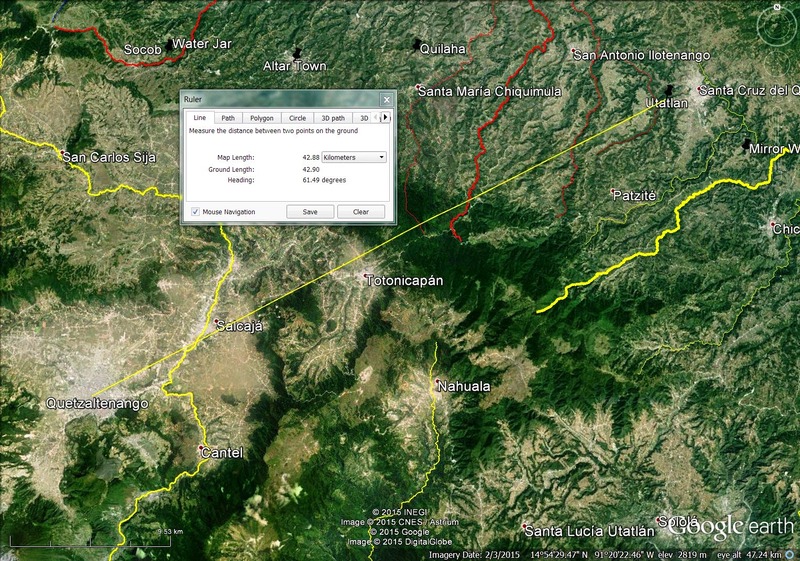 The distance from Chicabracan (Earthquake) to Utatlan (Quiche Mountain Quiche Valley) was considered very short (Rabinal p. 59). It was less than a day's journey (Rabinal p. 184). In fact, it was half a day's journey (Rabinal p. 258). A good metric for this reference is 8/.5 days = 16 air kilometers per day. The distance from Xol Chaqaj (Between the Wasp's Nests) to Chi K'otom / Chi Tikiram / chuch'a'xik (the place called Pitted and Planted) was less than a day's journey (Rabinal p. 254). The actual distance is slightly less than 10 air kilometers. From Nim Xol (Great Hollow) on the Cahabon east of San Pedro Carcha to the mountain sacred to the Quiche deity Tohil was several days' journey (Breath p. 20). The actual distance turns out to be about 95 air kilometers. 95/15 - 16 air kilometers/day = a 6 days' journey which fits the description "several days." From Great Hollow on the Cahabon to the head of K'ulk'u Siwan (Rumbling Intestine Canyon) was a strenuous, long day's journey (Breath p. 21). The actual distance is about 28 air kilometers. The distance from Xe Laju Kej (Quetzaltenango which is locally called "Xelaju" or simply "Xela") to Utatlan was more than two but less than three days' journey (Breath p. 103). The actual distance is about 43 air kilometers. From the eastern shore of Lake Atitlan to the modern city of Antigua was a three days' journey (Breath p. 223). The distance is about 45 air kilometers. 45/3 days = 15 air kilometers per day. All of these data points taken together tell a consistent story. In the Quichean area of highland Guatemala a normal day's pedestrian journey was and is a distance on the order of 15 - 16 air or straight-line kilometers. This corroboration of our deduced Nephite metric could hardly be more striking.